For the first game of this name on the Atari 2600, see Star Wars: The Empire Strikes Back. Star Wars: The Empire Strikes Back is an action platform game released for the NES in 1992. It is the sequel the original Star Wars game for the NES. 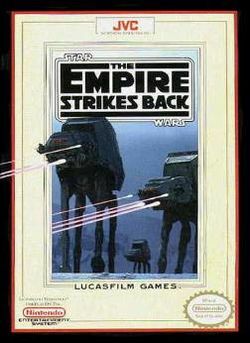 This is the second of three video games released under the Empire Strikes Back title for home video game systems. It was preceded by a version for the Atari 2600 and succeeded by Super Star Wars: The Empire Strikes Back for the SNES. The NES version was released the same year as JVC's Super Star Wars for the Super Nintendo Entertainment System. As Empire was released towards the end of the NES's lifecycle, a corresponding sequel to the film Return of the Jedi was never developed. A version of the game was released for the Game Boy. That product was reprinted and distributed by several publishers over the course of three years. This page was last edited on 23 October 2013, at 15:49.